Spring is in the air and everyone is itching to get outside after the Canadian thaw. Is there anything more exciting than that first warm morning on the patio with a cup of coffee or that first bonfire in the backyard with friends and family? After the long winters we experience here in Scarborough, ON, and the surrounding “tundra,” it is no surprise we love our warmer months so we can get outdoors. That said, do you have plans to renovate your home this summer? Maybe your kitchen needs some fresh paint or your roof needs new shingles. Or, perhaps you want to add patio doors to the back side of your home. Our team at Brock Doors and Windows would be delighted to help you with new or replacement patio doors. Our patio door lines have beautiful, quality options. But, why should you choose one of our patio sliding doors? Patio sliding doors provide a view. Small yard, large yard, quaint patio, upper-level deck—whatever you have, a new patio door instantly improves the look and feel of your home. The more routes in and out of your home, the better; am I right? 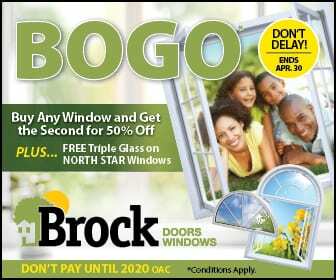 Additionally, our doors at Brock Doors and Windows will not become noisy or difficult to operate. We choose materials with high mechanical strength and stiffness to give your patio doors the “perfect slide” for a lifetime. Just as a mirror creates the illusion of a larger space, so do glass patio doors, which will serve to maximize the space in your kitchen, patio, deck, or bedroom! Go green and lower your energy bills! The sun’s natural heating and cooling ability partners with the glass used in our patio doors to lower your energy bills. We also offer various glass coatings to further insulate your home from cold and heat—coatings which reflect warmth back to its source. We are innately drawn to nature, so adding more entries to your home will naturally combat anxiety and promote tranquility. Also, whether you live on a busy street or in a quiet neighborhood, our well-crafted and streamlined windows are made to be a buffer against noise. When you purchase patio doors from Brock, you make a permanent investment in your home! Your new or replacement patio doors in Scarborough, Ontario are backed by our transferable, limited lifetime warranty, are certified by the Canadian Standards Association, and comply with American Architectural Manufacturers Association (AAMA) standards. We know our products are the best value for your investment! Ready for summertime and your new patio doors? Give us a call! We would love to meet with you for a free, no-pressure consultation at your home where we can brainstorm together. Whatever you decide, Brock Doors and Windows is here for you; we look forward to meeting you soon!